For Bridgeport High School Alum John Hadjis, this past Sunday was shaping up to be a pretty cool day. After all, not everyone can say they attended the National Football League’s Pro Bowl Contest. Even fewer can say they had a chance to be part of an F-16 fly-over at the game. Such was the case for 2007 Bridgeport High School graduate John Hadjis. On Sunday Hadjis, or United States Air Force Captain John Hadjis, was set to do both. As it turned out, he only got to do one. Due to issues created by Mother Nature, the fly-over Hadjis was to be a part of was scrapped. He would have been the second F-16 in the formation flying over Camping World Stadium in Orlando where the AFC and NFC battled in the Pro Bowl. The experience for Hadjis has been pretty cool since leaving Bridgeport High School. The well-rounded student-athlete applied for an was accepted to the United States Air Force Academy and, since that time, has been a standout in much the same way he was at BHS. 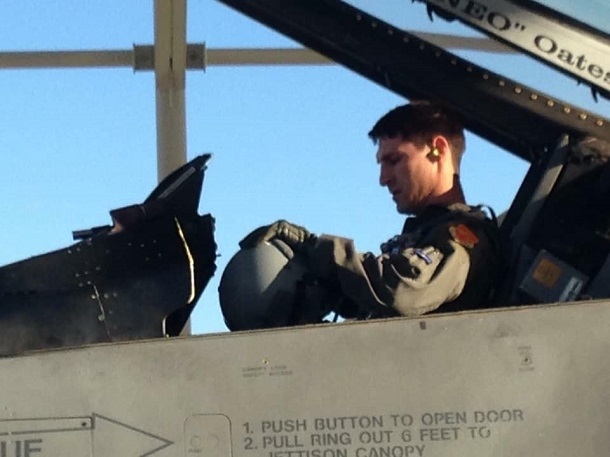 Hadjis graduated from the USAFA in 2011 where he managed to earn a degree in electrical engineering and a pilot spot to attend undergraduate pilot training. Even that took a sidestep when the Air Force offered to delay pilot training with the option to allow Hadjis to f urther his education at graduate school at the Air Force Institute of Technology at Wright Patterson Air Force Base, Ohio. In May of 2013, his Master’s Degree in electrical engineering was also earned. That would be followed by the undergraduate pilot training in April 2013. The class was held at Vance Air Force Base in Oklahoma. There, he not only completed three phases of training, but he excelled. And his excellence allowed him to choose what he wanted to do and that was be involved with the F-16. After more training and travel, Hadjis was through and a pilot manning one of the top pieces in the United States Military’s arsenal. For Hadjis, the initial hope this past week was to take that piece of machinery as part of a fly-over and it didn’t happen. There was, however, a silver lining to the clouds that stopped him and others from taking part. Had weather not been an issue, the crew would have taken the F-16s back to MacDill Air Force Base in Tampa. From there, they would have driven back to the Camping World Bowl to take in the rest of the game. Of course, Mother Nature wasn’t done with Hadjis or anyone else in Tampa during the contest. The NFL had provided them with bottom row seats, but they couldn’t enjoy them. “It was raining sideways,” said Hadjis who was a standout soccer, track and wrestling athlete along with being involved in school activities such as the BHS theatre. There was a silver lining there, as well. “Some of the people saw us avoiding the rain and they gave us their seats to avoid it. We were able to sit in an area with an overhang to it,” said Hadjis. Just getting to the point of being able to be part of a fly-over required multiple things to happen. The Secretary of Air Force Public Affairs has to be see if there is an Air Force base that can support it, if a squadron can support it and then individuals have to volunteer and be selected. 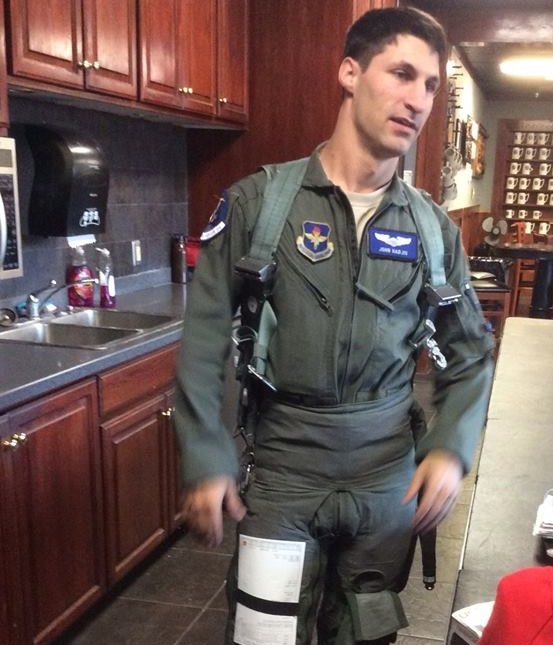 That all happened for Hadjis, who is stationed at Shaw Air Force Base in Sumter, SC. Soon, Hadjis and his wife Cameron and their daughter Cameron they had in November will be moving to Las Vegas to be stationed at Nellis Air Force Base. “We try to get back to Bridgeport when we can, but I think with my parents being grandparents there may be a few more trips to see us now,” said Hadjis with a laugh. Those trips will probably be fast ones for family, but not as fast as what Hadjis is used to. During his flight to Tampa, he was going roughly 400 miles per hour. His flown as fast as 1.4 Mach, which is well above 750 miles per hour. 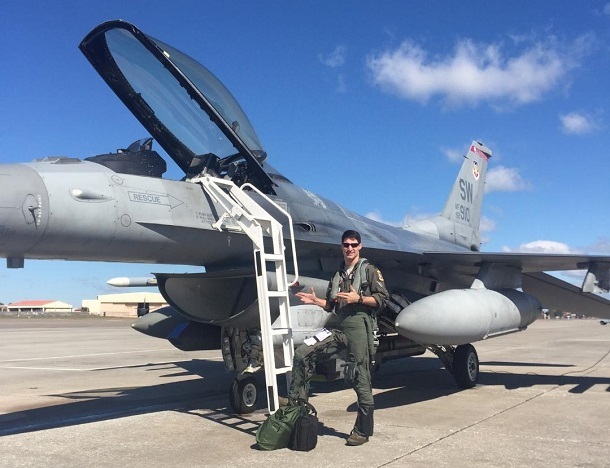 Editor's Note: Top photo shows Captain John Hadjis outside of his F-16, while he's shown in the middle getting ready to fly. Bottom photo also shows him inside a jet aircraft. All photos courtesy of Diana Hadjis.